To some people, this might be one of those “why is this even mythic?” cards. After all, it’s just a scaling token-generating card like Secure the Wastes or Martial Coup. On the other hand, it does basically double the number of creatures you control – or triple them if you control Parallel Lives – or, for that matter, quadruple them or at least your aggregate power in play, if you also control Gaea’s Anthem. And it has a very important word on it: Instant. In the face of something like Cleansing Nova, the convoke ability won’t help you so much, but throwing it out there after the opponent has tapped low for the sweeper certainly will, and even in creature-on-creature matchups, you’ll get plenty of advantage from casting it during the opponent’s end step and overrunning them with a surprise army. 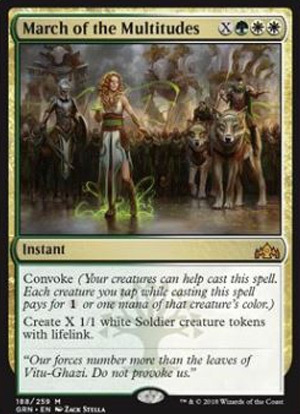 This is a very “Selesnya” card, if ever there was one: make an army using an existing army. While the tokens being 1/1 is suboptimal in a world with a certain Goblin Chainwhirler seeing a lot of play, this is a powerful spell all the same, as the tokens have lifelink and you can generate a massive swing without a ton of mana. And you can cast it at instant speed, letting you attack in after the coast is clear. There will be decks where this is stronger, but I feel like this is likely going to either see play now or see play after a Goblin Chainwhirler ban (or rotation).